Federal Airlines, also known as FedAir, is a South African airline operating scheduled and charter flights on the African domestic network. Federal Airlines fly to many destinations including Kmia, Phinda, Ulundi, Durban, Madikwe, Maun, Windhoek and many others. Federal Airlines offers daily shuttles to South Africa’s most popular safari reserves. This includes luxury safari lodges based in Sabi, Kruger, Timbavati, Phinda and Madikwe. The airline's main base is OR Tambo International Airport, Johannesburg, with hubs at Kruger Mpumalanga International Airport, Nelspruit and Vilanculos Airport. 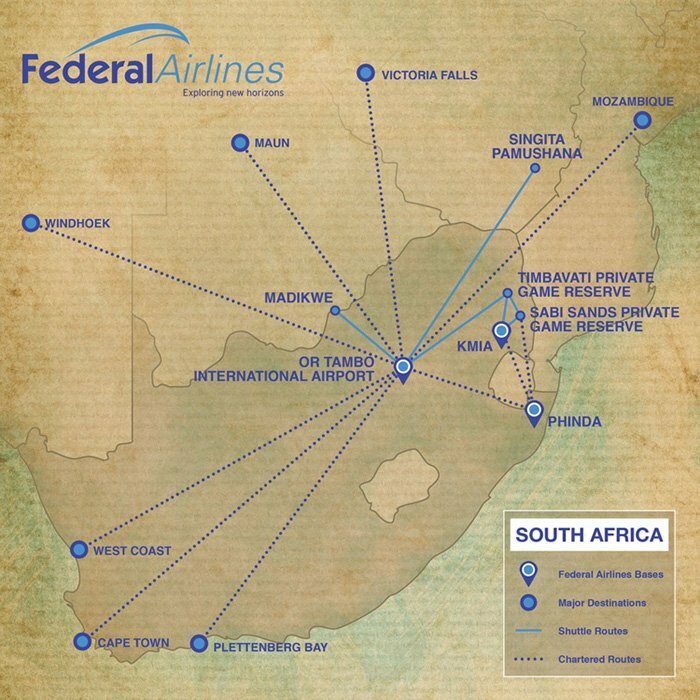 Federal Airlines is one of the most multi-faceted aviation companies in South Africa. Federal Airlines innovated the service of doing guest shuttles out to some of Africa’s most stunning luxury safari lodges in the 90’s. Federal Airlines have since partnered with world leaders in luxury safari experiences. Find out more about safari flights. The Federal Airlines fleet currently includes Beechcraft 1900, Beechcraft Baron 58, Beechcraft King Air B200, Cessna Gran Caravan, Pilatus PC 12 aircraft, Learjet45, Embraer 145 Regional Jet and Cessna Mustang Jet aircraft. Carry-on baggage is restricted to one piece of hand baggage weighing no more than 5kg. Cases with hard shells are not allowed on the aircraft. Suggested luggage size is 40cm x 30cm x 60cm (16in x 12in x 24in). If your baggage exceeds the hand baggage requirements, the airline offers a complimentary luggage storage facility for return flights. 60kg of extra baggage allowance can be obtained through purchasing an extra airline seat. 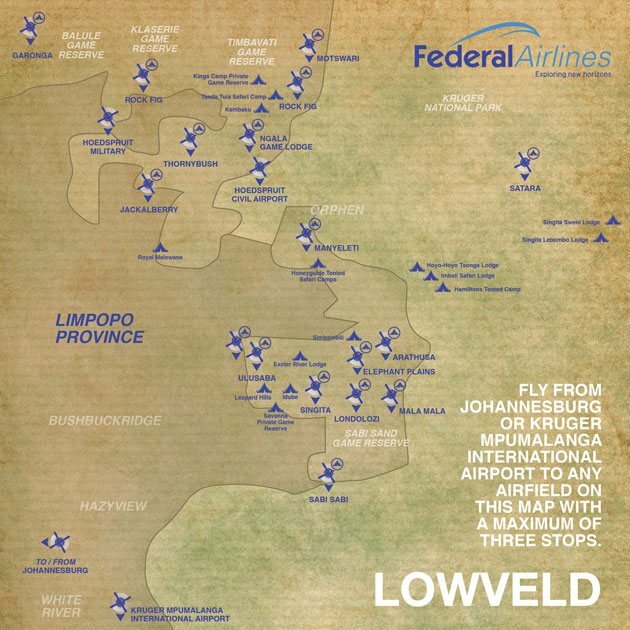 Federal Airlines is based at O. R. Tambo International Airport, which is a major international airport in Kempton Park, South Africa, near the city of Johannesburg. It serves as the primary airport for domestic and international travel to/from South Africa and is Africa's busiest airport with a capacity to handle up to 28 million passengers annually with non-stop flights to all continents except Antarctica. Airlines that fly from and to Tambo International Airport include British Airways, Kulula, Ethiopian Airlines and South African Airways. Forerunner in the safari industry, Singita, plans to revoluntionise the industry with its new airline partnerships with Grumeti Air and Federal Airlines. These two regional airlines will provide direct access between guests and the thousands of acres of land and wildlife that Singita promises to protect and preserve for 100 years. From this summer (June), Federal Airlines will be launching an exclusive new daily jet service for Singita guests, which for the first time will include a selection of new guest services and reduce the flying time from an hour to just over half an hour. Flights will also service passengers from Tambo International Airport in Johannesburg to Singita lodges in the Sabi Sand, providing direct non-stop access. Singita also announced that its partner airline Grumeti Air in Tanzania will make it quicker, easier and safer than ever to visit the six lodges and camps within Singita Serengeti. With a flight every day that takes just over an hour, directly from Arusha to Singita Sasakwa Lodge via Kilimanjaro, guests avoid the lengthy journey of the past that involved multiple stops along the way. The direct route will open up the best of the Serengeti, and with Lamai just a 15-minute hop away, an exclusively Singita East African itinerary is now much more accessible.